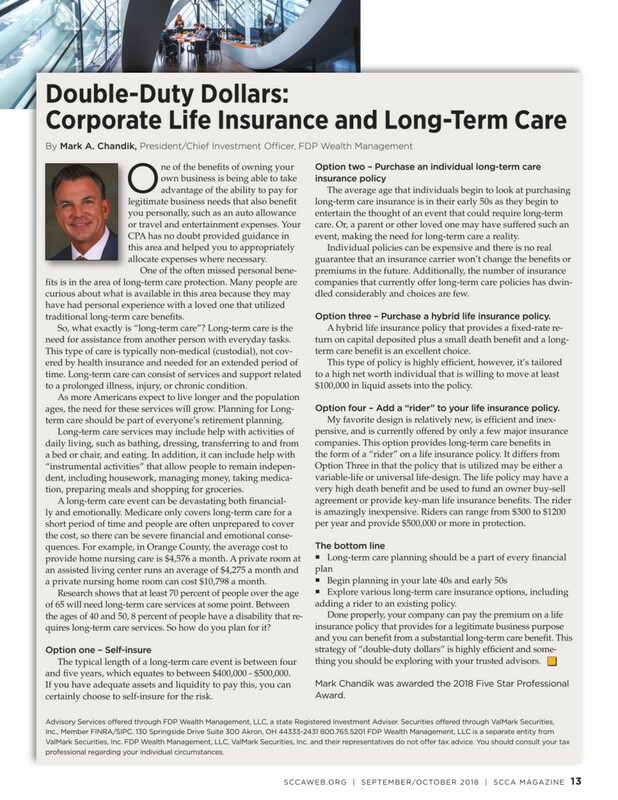 Mark Chandik’s article “Double-Duty Dollars: Corporate Life Insurance and Long-Term Care” was recently published in the Southern California Contractors Association Magazine. It features four highly efficient corporate life insurance and long-term care options that a business owner can choose from that will result in double-duty dollars. To find out what the options are and how they can work for your business or someone you know, click this link for the ARTICLE. Reproduction Prohibited without Express Permission. Copyright © 2018 FDP Wealth Management. All rights reserved. Advisory Services offered through FDP Wealth Management, LLC, a state Registered Investment Advisor. Securities offered through ValMark Securities, Inc., Member FINRA/SIPC | 130 Springside Drive Suite 300 Akron, OH 44333-2431 | 800.765.5201. FDP Wealth Management, LLC is a separate entity from ValMark Securities, Inc. FDP Wealth Management, LLC, ValMark Securities, Inc. and their representatives do not offer tax or legal advice. You should consult your tax or legal professional regarding your individual circumstances. Indices are unmanaged and cannot be invested directly in. Past performance is not a guarantee of future results.